An Islamist Web site recently posted an item titled “How to Join Al Qaeda,” calling on Muslims to regard jihad as a personal duty and to buy weapons, brainstorm and plot plans to kill Americans. “Assassinating the ambassador takes no more than a gun and a bullet,” according to the alleged posting. A jihad cell should have no more than five members — “all absolutely trustworthy” — with a commander who is “Osama bin Laden to the cell members,” according to the posting. The members must be secret, perform intelligence tasks, collect information, raise funds, recruit other members and assist in operations. “Those who act in the open must perform the primary military operations, such as assassinations, firing at enemy facilities, etc.,” according to the post. The Middle East Media Research Institute, a group based in Washington, D.C., that monitors about 90 of these types of Web sites, translated the posting. The Web site started in Egypt, then went inactive and appeared again under a different name. The Web site passed through Site Genie, an American service provider in Rochester, Minn.
Click here to read the report from the Middle East Media Research Institute. The Minnesota Joint Terrorist Task Force is investigating the alleged posting, said Paul McCabe, a spokesman for the FBI in Minneapolis. The Jawa Report has two articles related to this, the first discuss the quick demise of the site, the second discusses the EU Islamic Jihadist that are upset that the site was taken down. People wake up something is in the works, look at each of the recent events and then look at the whole of them. Ahmed Mohamed and Youssef Megahed have been indicted for terrorism related charges. Megahed has been indicted for “transporting explosives in interstate commerce without permits”, while Mohamed is charged with this in addition to “distributing information relating to explosives, destructive devices, and weapons of mass destruction”. The four week investigation included searches of several locations in Florida including a storage facility. Two Egyptian students at the University of South Florida were indicted Friday for carrying explosive materials across states lines and one of them was charged with teaching the other how to use them for violent reasons. He and Youssef Samir Megahed, 21, an engineering student, were stopped for speeding Aug. 4 in Goose Creek, S.C., where they have been held on state charges. The two men were stopped with pipe bombs in their car near a Navy base in South Carolina where enemy combatants have been held. They were held on state charges while the FBI continued to investigate whether there was a terrorism link. Mohamed was charged with distributing information relating to explosives, destructive devices, and weapons of mass destruction, which is a terrorism-related statute, a Justice Department official said. The crime carries a maximum of 20 years in prison. He and Megahed both face with charges of transporting explosives in interstate commerce without permits, which carries a 10-year prison penalty. Their defense attorney, Andy Savage, did not immediately return a call seeking comment. The indictment was handed up in Tampa, Fla.
“The arresting deputy’s vigilance and the immediate response of our local investigators and prosecutors are highly commendable,” Lloyd said in a statement. Both Mohamed and Megahed are in the county legally on student visas, officials said. In South Carolina, where Mohamed and Megahed have been held in the Berkeley County jail, U.S. Attorney Reginald I. Lloyd praised state and federal authorities for cooperating in the four-week investigation that initially did not look like a terrorism case. “The arresting deputy’s vigilance and the immediate response of our local investigators and prosecutors are highly commendable,” Lloyd said in a statement. Since the Aug. 4 arrest, authorities sought to determine whether Mohamed and Megahed were fledgling terrorists or merely college students headed to the beach with devices made from fireworks they bought at Wal-Mart in their car, as they claimed. The local sheriff in South Carolina said the explosives were “other than fireworks.” The charges follow several searches in Tampa, including of a storage facility and a park where the explosives might have been tested, authorities said. Two University of South Florida (USF) students have been indicted by a federal grand jury in Tampa, Florida, for transporting explosives materials without permits, the Department of Justice announced today. The two-count indictment unsealed today charges Ahmed Abdellatif Sherif Mohamed and Youssef Samir Megahed, both Egyptian nationals, with transporting explosives in interstate commerce without permits. The indictment alleges that the two men, “not being licensees” under federal law, “did knowingly transport and cause to be transported in interstate commerce explosive materials” on or about Aug. 4, 2007 in the Middle District of Florida and elsewhere. Mohamed was also charged with distributing information about building and using an explosive device. The indictment alleges that Mohamed taught and demonstrated the making and use of an explosive and destructive device, with the intent that such information be used for, and in the furtherance of, an activity that constitutes a federal crime of violence. Mohamed, a civil engineering graduate student and teaching assistant at USF, and Megahed, an engineering student, were stopped for speeding and subsequently arrested on Aug. 4, 2007 in Goose Creek, S.C. by a South Carolina Berkeley County Sheriff’s deputy. Both Mohamed and Megahed were charged with possession of an explosive device, in violation of South Carolina law. Bond was set for Mohamed in the amount of $500,000 and for Megahead in the amount of $300,000. Both men are currently being held in Berkeley County jail. The charges in the indictment are merely allegations, and the defendants are presumed innocent unless and until proven guilty. The charge of distributing information about explosive devices carries a maximum penalty of 20 years in prison, and the charge of transporting explosive materials carries a maximum penalty of 10 years in prison. This case is being prosecuted by the U.S. Attorney’s Office for the Middle District of Florida, with the assistance of the National Security Division at the Department of Justice in Washington, D.C. The case was investigated by the Federal Bureau of Investigation and the Joint Terrorism Task Forces in both Tampa and South Carolina, with the assistance of the United States Attorney’s Office for the District of South Carolina. Two University of South Florida men indicted on charges of carrying explosives across state lines; one indicted on terror charges. He and Youssef Samir Megahed, 21, an engineering student, were stopped for speeding in Goose Creek, S.C., on Aug. 4, where they have been held on state charges. Rusty at The Jawa Report mused about the other possible terror plot yesterday. The Taliban has finally released the remainder of the living hostages it took in an attempt to have jailed terrorists released. The idea of non-negotiation of hostages is a fundemental principal for preventing more kidnappings and killings. However when bending over and giving the hostage takers anything, you are empowering them. You give them and others reason to continue the violence. You be come the enabler. Please remember the hostages this time were there to help Afghans in hospitals, it is not just random people, they were there to help the Afghan people. Granted, I am grateful that the remaining hostages are alive, however how many will die in the future for this mistake. CVT is reporting that the Taliban already has plans to kidnap more people and negotiate because they deem this last hostage taking/killing as a sucess. The seven remaining South Korean hostages taken captive last July by the Taliban have been released, and insurgents have vowed they will abduct more foreigners. “We will do the same thing with the other allies in Afghanistan, because we found this way to be successful,” Taliban spokesman Qari Yousef Ahmadi told The Associated Press by phone on Thursday. Twenty-three 23 South Koreans, all volunteers from a church group, were kidnapped by Taliban militants on July 19. Two of the male captives were later executed by gunfire. The group had come to Afghanistan to volunteer at hospitals, and were travelling from Kabul to Kandahar City when the Taliban seized them by gunpoint. When the last hostages were freed Thursday, men accompanying them handed a note to journalists, claiming the South Koreans had come to convert Muslims. Relatives of the hostages and the South Korean government have maintained the group was only in Afghanistan to help suffering Afghans, not to do missionary work. The insurgents freed the final hostages Thursday in two groups. First, two men and two women were released to representatives of the International Red Cross on a road in the Janda area in central Afghanistan. Hours later, the three remaining hostages — two women and a man — were released. On Wednesday, the Taliban released 12 of the hostages into the care of the Red Cross at three separate locations in central Afghanistan, near the city of Ghazni. The South Korean government said Tuesday that they reached a deal by agreeing to pull all of their troops out of Afghanistan by the end of 2007, as already planned. The South Koreans also had to agree to stop all missionary work in the country. Two female South Korean hostages were freed on Aug. 13, before the deal was reached. Taliban leaders had demanded that prisoners be released in exchange for the Koreans’ lives, but the Afghan government said it was not prepared to let go of any prisoners. Some analysts said negotiating with the Taliban gave the insurgents political legitimacy. “Taliban now have diplomacy, they have got spokesmen, they value cameras, they have a political dimension for their movement, and their aim is to be recognized as legitimate,” Mustafa Alani, director of security and terrorism studies at the Dubai-based Gulf Research Center, told AP. The South Korean government has said it’s common practice to negotiate with hostage-takers. Kidnapping and killing hostages is Diplomacy and Legitimate. What the hell is wrong with this line of thought? Come on people, this is the farthest thing from Diplomacy and Legitimacy. Wake up world, you are just giving them more weaponary, it is actions that kill, and actions like these will kill even more people. Michelle Maklin reports more on the Seattle Ferry Threat. Apparently this is has been in the works for a while, but the FBI had been treating it as classified. Which leads one to believe the big search by the USCG a few weeks ago must have had a escalation of information. As she points out, the Philipino connection is a very ominous one, considering the bombing of a ferry in the Philipines and the links to the WTC bombing back to Islamic Terrorists in the Philipines. I am still amazed that this is being considered “Profiling”. Even if it was, I think the actions of these two individuals warrant the use of Profiling. I am sure more is to come from this, maybe not all public. The FBI is still sifting through hundreds of tips on the two suspicious men in Seattle whom ferry employees witnessed photographing restricted areas and pacing several ferry routes, “as if trying to measure distances,” over the past several weeks. I have learned that these men have been the subject of much investigative energy within homeland security bureaucracies for quite some time. Indeed, one source told me that until the FBI released the photos of the men, the snapshots had been handled as classified material. Arab-American and Muslim groups have suggested that the FBI is unfairly profiling Middle Eastern men (even though no one at the FBI has breathed a word about the men’s ethnicity or religion). But as I’ve noted many times in speeches and debates about profiling, if Filipinos were engaging in this same sort of suspicious behavior, I’d want the feds to give them every bit of extra scrutiny they deserve. And I believe they are. Abu Sayyaf jihadists and other loosely-affiliated al Qaeda off-shoots in the Philippines pose national security risks not just to that country, but to the rest of the free world. Operation Bojinka, the precursor to the 9/11 attacks, was hatched in the Philippines. Ramzi Yousef, the convicted mastermind of the 1993 WTC bombing, trained operatives in the Philippines and set up bases and finances there with Khalid Sheik Mohammed for bin Laden. And as I noted in my first post on the Seattle ferry story on Aug. 21, al Qaeda-linked operatives in the Philippines have targeted ferries before for mass murder and violence. Those plots and the jihadists behind them are worth a closer look. Filipino Muslim convert Redendo Cain Dellosa, aka Habil Akmad Dellosa, admitted to carrying out the bombing of a superferry in February 2004 that killed 116 people in Manila Bay. Dellosa had trained under an Indonesian Jemaah Islamiya (JI) instructor in January 2003 in Jolo, Sulu and underwent further explosives training in Buti, Lanao del Su, according to Filipino authorities. Dellosa told police he had carted eight pounds of TNT in a cardboard box onto the ship, concealed it in a TV set in a cabin bunk, and deboarded the ferry before the timed bombing device exploded and partially sunk the vessel. Militant Muslims working for Abu Sayyaf were fingered in another ferry bombing in the Philippines in 2005. Stratfor looks at ferries as jihad targets here. The Christian Science Monitor and Western Resistance outline the threat of Filipino Muslim converts who have spread from the southern islands to the main island of Luzon, where they blend in with Catholic names. They are part of a larger “Balik Islam” (Return to Islam) movement converting Filipinos in droves to the cause of jihad. Among the prominent Filipino jihadists arrested for terrorist plotting: Rajah Solaiman group founder Ahmed Islam Santos and No. 2 leader Pio Abogne de Vera. Others arrested in airport, mall, and church bombing plots have ties to JI and Abu Sayyaf. Four were apprehended as they got off a ferry in February 2005. Saudi terror funding has poured into the Philippines through charity front groups. The financial interconnectivity is explored in more detail here. Behind every picture, there’s a bigger picture. Behind the FBI photo of the suspicious Seattle ferry riders, there may be many more dots to be connected than are immediately obvious to the public. In other words: Keep your eyes wide open. And as always, if you see something, say something. That major Hillary Clinton bundler…who encouraged Winkle Paws and family to pony up tens of thousands… is a fugitive from the law, the Los Angeles Times reports. He pleaded no contest to grand theft but his lawyer claims he doesn’t remember the plea — a Craigian twist, no? Campaigns employ compliance offers to make sure that their donors don’t violate the laws, but given how frequently these major donors turn out to be…. not so peachy, perhaps they ought to institute background checks for their bundlers. The NYT’s is reporting how Clinton is going to give up her funds from Hsu, nice to do that now that you have been caught. Maybe you should have done it before you got caught, it would carry more weight with most. “In light of the new information regarding Mr. Hsu’s outstanding warrant in California, we will be giving his contributions to charity,” said Howard Wolfson, Mrs. Clinton’s campaign communications director. my obligations and certainly not the law. “I would not consciously subject any of the candidates and causes in which I believe to any harm through my actions. major donors to her campaign. As part of this group, Mr. Hsu had attended meetings of the group with the campaign finance director, Jonathan Mantz, in the New York offices of Alan Patricof, a leading donor to Mrs. Clinton, as well as gatherings in Washington. Amazing, I bet if Hillary gets into office, that these guys will all get pardons at the end of her Terms… Sound familiar… If it doesn’t, Mark Rich, the guys who never stood trial, ran from the law and was pardoned, preventing him from being brought to trial. The odd thing I have noticed, is only two or three people I know actually know that Rudy is the the one that brought charges against Rich, while he was Prosecutor for NYC. Kind of funny how it is Rudy and Hillary in the lead. (For those that do not remember, Rich was being charged for violation of trade embargos with Iran…) Who is one of the big countries in the world trying to make nukes???? All said and done, Hillary let’s move on that Campaign Financing Reform the Liberals have been stalling on, but yet swore they were going to do last year before the elections. The TampaTribune is reporting the Grand Jury case for the Goose Creek Fireworks Kids is requesting DNA samples from Youssef Megahed. This request is rather strange, indicating they are looking for some link between him and some physical evidence not yet made to the public. Many people have testified with the Grand Jury, including the owners of the home that has been linked to World and Islam Studies Enterprise (WISE). WISE was the Jihad organizaion founded by the covicted professor from University of South, Sami Al-Arian. A federal grand jury in Tampa is asking for DNA and hair samples from a University of South Florida student jailed four weeks ago in South Carolina on explosives charges, his attorney said. Andrew Savage said in a phone interview Wednesday night that he had no indication why the samples were being sought from his client, Youssef Megahed. The news came as the grand jury heard testimony Wednesday from people who have connections to Megahed and Ahmed Mohamed, another USF student arrested at the same time. Accompanied by attorneys, at least three people entered the grand jury area of the U.S. District courthouse on North Florida Avenue in downtown Tampa. They were the owner of a home where Mohamed planned to rent a room, the landlord’s son and a Muslim community spokesman. All three later declined to comment to a reporter. Megahed and Mohamed, were pulled over for speeding in South Carolina on Aug. 4 about seven miles from the Goose Creek Naval Weapons Station, which houses a military prison for enemy combatants. The men were charged with possession of an incendiary or explosive device, based in part on items found in the trunk of their car, authorities said. Mohamed said they were carrying fireworks. One week later, on Aug. 11, the FBI searched a home at 12402 Pampas Place in Tampa that is owned by Noor and Ana Salhab. Authorities said the search was related to the case involving the students. Noor Salhab later told reporters that his son, Ghassan, has been living in the home and that he has been renting to college students while waiting to sell it. Noor Salhab said a friend of Mohamed’s rented a room there, and Mohamed planned to move in on Aug. 7. Noor and Ghassan Salhab, with attorney Brooke Elvington, spent about an hour in the grand jury area Wednesday. Neither would talk to a reporter. Grand juries meet in secret by law. It was not known what questions were asked. At the end of the day, Assistant U.S. Attorney Jay Hoffer gave U.S. Magistrate Thomas Wilson a report from the grand jury, which the judge promptly sealed. Hoffer later declined to comment. After the Pampas Place house was searched this month, Noor Salhab told reporters that the FBI seized a number of items, including a gas tank for a lawn mower, a telephone, his son’s computer and some pipe. Federal court records show that Salhab leased the house in the early 1990s to World and Islam Studies Enterprise, a think tank run by Sami Al-Arian, the former USF professor accused of funding Palestinian terrorist organizations. Elvington said she represented one of the Salhabs but did not specify which one. She formerly represented Ghassan Ballut, one of Al-Arian’s co-defendants, on terrorism-related charges. Ballut was cleared after a trial in which jurors deadlocked on some charges against Al-Arian and acquitted him on others. Also appearing before the grand jury Wednesday was Ahmed Bedier, who has been a spokesman for the Megahed family. Bedier is executive director of the Tampa chapter of the Council on American Islamic Relations and a frequent media spokesman for Muslims and Islamic causes. He was accompanied by attorney Lyann Goudie and appeared to be in the grand jury area for about an hour. Bedier declined to answer questions about his testimony, saying he wanted to check with the national headquarters of CAIR about what he was allowed to say. Bedier has called for fairness in the investigation of the students. He has stopped short of vouching for them. The students are being held in a South Carolina jail. Bail is set for Mohamed at $500,000, and for Megahed at $300,000. A preliminary hearing on the explosives charges is set for Sept. 21. Prosecutors say they are still trying to determine what the men were doing, where they were headed. …The car had a Global Positioning System device, so investigators would have a record of all the men’s movements…Not to mention cell phone records. There’s a preliminary hearing on the explosive charges set for Sept. 21. Odd, a GPS and they were that far off course…. 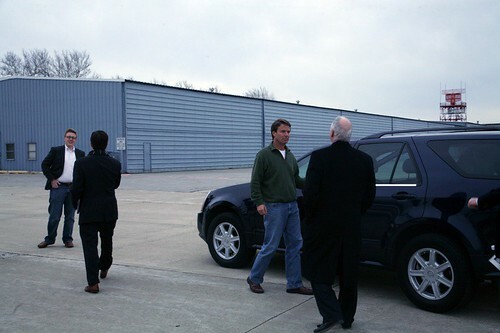 Ed Grubman has pics of Edwards getting into his SUV after telling a group of machinists they should sacrafice their SUVs. Here we go with the Al Gore Carbon Credit crap. Another words if you are rich you are exempt because you will buy carbon credit, what a load of crap. • My Little Pony John Edwards A Hypocrate? Noooo! This is Edwards getting into his SUV… In Iowa Hillary rode around in an 18-Wheeler. Obama an RV, and Edwards in a Cadillac SRX Crossover which gets just 15 MPG. All of this of course happens when he’s not flying around the US in a private jet which has been proven to be far worse than driving even the least fuel efficient car. Now we’ve truly heard it all. Rising gas prices are the latest John Kerry [related, bio] campaign theme, so naturally the senator was asked this week about his personal vehicle usage. And that’s without mentioning the other gas-guzzlers this candidate and his family enjoy, all the while posturing about reducing the nation’s dependence on foreign oil and fuel efficiency. At last count, there were eight “family” cars and SUVs, including the 1995 Suburban (15 mpg highway, 12 mpg city), a 1993 Land Rover Defender (12 mpg highway, 10 mpg city), a 1989 Jeep Cherokee (20 mpg highway, 16 mpg city), a 1994 Jeep Grand Cherokee (20 mpg highway, 15 mpg city), a 2001 Audi Allroad (21 mpg highway, 15 mpg city), a 2001 Chrysler PT Cruiser (25 mpg highway, 20 mpg city), a 1985 Dodge 600 Convertible (26 mpg highway, 23 mpg city), and a 2002 Chrysler 300M (26 mpg highway, 18 mpg city). Kerry, however, only owns up to the latter two. Do as I say not as I do huh? Well the Nanny State in which we are all slowly being brought into has finally arrived. They seem to feel that they need to tell us what to do because we are too stupid to make our own decisions n this world. I know I am not a Sheeple, i have a sports car that gets about 25-30 MPG on the highway. I enjoy spending my money on my kids and not on some Arabian’s in ground da-durka shaped pool. If they want us to like them quit bullshifting us thinking we don’t know what they are up to!